Forage plants -- Varieties -- Indonesia. At head of title: TropSoils Indonesia / Center for Soil Research. under Sitiung edaphic and climatic conditions. crops as well as animal feeds. without lime and P additions. FCC: Cak. last 9 (reatments were added locally. Lime was broadcast over all plots at a rate of 375 kg CaCO3/ha (to give about 0.5 meq Ca/100 g soil to a 15 cm depth) except on the high lime plots which were limed at a rate of 5.4 T/ha (2 x meq Al). P was banded at 40 'kg P/ha. The P (TSP) was applied in 20cm wide strips and hoed in to a 20cm depth. The seed was planted in rows 50cm apart. Plot dimensions are 2m x Sm and there are lm gaps between plots. 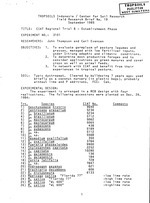 As per instructions from CIAT, the data collected for this trial include: 1)plant counts and height measurements during establishment; 2) plant counts and height during production; 3) dry matter production at 8 week intervals, except during minimum and maximum precipitation periods when 1 m2 subplots will be harvested at 3, 6, 9, and 12 week intervals. Also some estimates were made of plant canopy coverage ("mulching percentage"). All species germinated well except C. coeruleum, C.
muconoides, P. palustris, V. hosei and Z. latifolia. Seed of the first 3 of these species were scarified before replanting. The grasses and Desmodiums were slow to establish but grew and spread well after the first month. The alfalfa germinated well but began to exhibit chlorosis and nectrotic leaves within 2 weeks and most had died on both low and high lime plots by 4 weeks. All forages, except the alfalfa (which were abandoned at this point), were replanted where necessary on January 30, 1985. Cuttings of Setaria ancegs obtained from Jambi Province, were planted into the treatment 23 plots (low lime 'Florida 77' alfalfa) on March 15. Since the P. palustris never germinated, it was replaced by V. hosei to make the latter a fully replicated treatment. The P. phaseoloides was severely infested with a leaf rolling insect in April, which greatly reduced it's yield in the first harvest. It recovered well after that, however. The first harvest was made on April 19, 1985 and involved all treatments except 23, 24, 25, 26, 27, 30, and 31 which had either died or were not suf ciently established. The harvested subplot was the central 3 m of the middle two rows (ie. 3m x Im area. The second harvest was made on June 17, 1985 (two months after the first harvest) and included all treatments except 2 25, 26, 30 and 31. The harvested subplot was the central 4 m of the middle two rows (ie. 4m x Im area)..
Growth data taken on April 8 (before the first harvest) is presented in Table 1. Table 1. Plant growth at 103 days after planting. Treatment means for the first harvest (on April 19, 1985) are shown in Table 2. The results are reported on a sun dried weight basis since other drying facilities were not available. The analysis of variance for the first harvest was calculated and both treatment and replication effects were significantly different at the 0.001 level. In Table 3, chemical analyses for the whole forages are presented. Table 2. Ranked treatment means for harvest on April 19, 1985. Means followed by the same letter do not differ significantly at the 0.05 level according to Duncan's Multiple Range Test. The analysis of variance for the second harvest (on June 17, 1985) was calculated and treatments were significantly different at the 0.001 level and replications at the 0.01 level. Treatment means are shown in Table 4. Table 4. Ranked treatment means for harvest on June 17, 1985. Means followed by the same letter are not significantly different at the 0.05 level according to Duncan's Multiple Range Test. Subsequent management of this trial will entail fertilizing everything with K (and possibly Mg) and the grasses with N. The productivity of the forages will also be compared during rainy and dry seasons. The overall management philosophy for thi's trial entails a low input approach, since the consensus of TROPSOILS researchers is that local farmers would not be willing to apply much fertilizer or pesticide to forages. Therefore, no pesticides will be used and lime and P will not be reapplied.